The beaches of Hatteras Island, North Carolina are known for their soft sand, blue waters, rolling waves, and tranquility. You'll often enjoy a stretch of beach all to yourself, with only the occasional sea gull or frolicking dolphin for company. 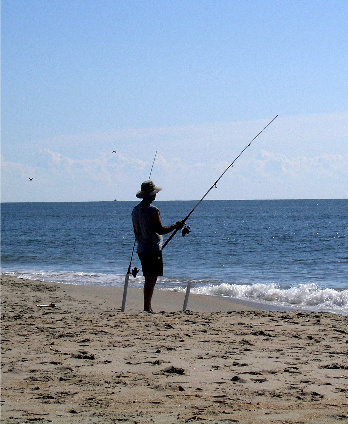 Hatteras Island's beaches offer terrific fishing, beachcombing, bird watching, sunning, surfing, kite boarding, relaxation and of course, the famous Hatteras Beach Driving. This long stretch of coastline offers miles of serenity and natural beauty. On Hatteras Island, there are basically two ways to enjoy the beach: 1)Parking at a public beach access and walking to the beach, or 2) Using designated ORV (off-road vehicle) ramps to drive directly onto the beach. There is no charge for beachgoers who would like to park their cars at these public beach accesses and take a short walk to the beach. During the summer months, these access areas are usually busy, but it is just an easy walk down the beach to find a more secluded spot. You will find a mix of families; water sports enthusiasts, and anglers at these public beach accesses. It's a fun and convenient way to experience the gorgeous beaches of Hatteras Island. South of Avon, Hwy 12: The Avon public beach access offers handicap parking spaces, a paved parking area, bathrooms, and showers. South of Frisco, Hwy 12: The Frisco public beach access offers a bath house with restrooms and showers. Numerous Off-Road Vehicle (ORV) ramps are available on Hatteras Island.ORV ramps are designated access roads that allow 4-wheel drive vehicles to drive directly onto the beach. For a full list of ramp locations and Hatteras beach driving regulations please visit the Cape Hatteras National Seashore website . So What's This I Hear About Hatteras Beach Driving? Hatteras Beach driving, or off-road vehicle (ORV) use, is one of the many great things about Hatteras Island. Fishermen, surfers, families, and beach bums of all sorts love to get in a 4-wheel drive and experience the beautiful coastline. You have likely heard that beach driving, or ORV use, has been restricted in certain areas. It is true that some areas of the Cape Hatteras National Seashore may experience temporary closures due to mandated bird and wildlife protection. These temporary closures vary from day to day based on wildlife activity. There's still plenty of shoreline available for beach driving! Here's an example: According to the National Park Service website, on July 8, 2008, more than 29 miles of coastline was open for beach driving and another 25 miles of beach was open to pedestrian beachgoers! Only 15 miles of beach was temporarily closed for wildlife protection. Conveniently monitor beach driving/ORV accessibility on the Cape Hatteras National Seashore website - it includes helpful FAQs, as well as an interactive Google Earth map of ORV ramps. The Hatteras Island you know and love is awaits for beach driving! Come see us soon! Don’t forget your permit for Hatteras beach driving! The Off Road Vehicle (ORV) permit offices are open 7 days a week, 8:00 a.m. to 4:30 p.m. year round, except for Christmas day. For more information visit the Cape Hatteras National Seashore websites at www.nps.gov/caha, or by calling 252-441-2111. Visit Cape Hatteras, NC - A "Top 10" Beach! Cape Hatteras, on Hatteras Island, at the southern end of North Carolina's Outer Banks, took the number ten spot on Dr. Beaches' 2012 Top 10 Beaches List! This annual ranking of US beaches is compiled by Dr. Stephen Leatherman, Ph.D., Director of Florida International University's Laboratory for Coastal Research. Dr. Leatherman has over 30 years of research experience and is an internationally recognized expert on beaches and coastal regions. Over 650 US beaches are judged each year on factors such as water color and quality, wave size and number, softness of the sand, wildlife and natural features, facilities, lifeguard protection, views and traffic. Cape Hatteras’ beautiful beaches met all the standards for Dr. Beaches' stringent criteria, making it on the 2012 prestigious Top 10 Beaches List.